244 pages | 1 B/W Illus. Latin American and Caribbean communities and civil societies are undergoing a rapid process of transformation. Instead of pervasive social atomization, political apathy, and hollowed-out democracies, which have become the norm in some parts of the world, this region is witnessing an emerging collaboration between community, civil society, and government that is revitalizing democracy. This book argues that a key explanation lies in the powerful and positive relationship between community and civil society that exists in the region. 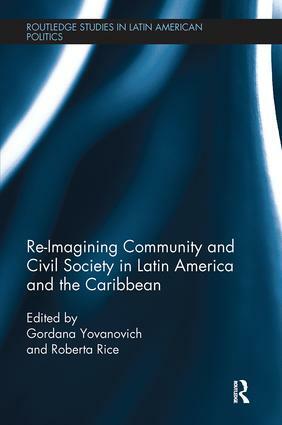 The ideas of community and civil society tend to be studied separately, as analytically distinct concepts however, this volume seeks to explore their potential to work together. A unique contribution of the work is the space for dialogue it creates between the social sciences and the humanities. Many of the studies included in the volume are based on primary fieldwork and place-based case studies. Others relate literature, music and film to important theoretical works, providing a new direction in interdisciplinary studies, and highlighting the role that the arts play in community revival and broader processes of social change. A truly multi-disciplinary book bridging established notions of civil society and community through an authentically interdisciplinary approach to the topic. Maca Suazo and Lisa Bellstedt. Chapter Twelve: "Radical" Participatory Democracy Institutions in Venezuela and Ecuador: Strengthening Civil Society or Mechanisms for Controlled Inclusion? Gordana Yovanovich is a professor and graduate coordinator for the Latin American and Caribbean Studies program at the University of Guelph. Roberta Rice is an assistant professor in political science at the University of Calgary.